KB937287 -- "configuring updates stage 3 of 3. 0% complete"
A few people have run into a problem after installing KB937287, of the pre-requisite updates for SP1. The solution for this issue is available in KB949358. If you have any problems following those instructions, please call 1-866-PC-Safety (1-866-727-2338). This phone number is for virus and other security-related support. It is available 24 hours a day for the U.S. and Canada. Should you call that number, be sure to tell the person who answers that you are calling in reference to a Windows Update issue. Although most programs will continue to work as expected after you install Windows Vista SP1, some programs were reported as resulting in a loss of functionality after SP1 was installed. The programs and the link to the vendors' solutions are available in KB935796. With SP1, "Reduced Functionality Mode" (RFM) has been removed and replaced with a notifications-based experience. For a full report and screen captures of what this entails, see Taking the next step with Windows Vista SP1. Lavasoft: Can you hear me now? On the surface, at least, it appears that there are strange goings on in LavaLand. As of this posting, there is no sign of the "Immediate Release" press release appearing anywhere at Lavasoft.com, in the News, the Blog or the Press Room. Yet, it showed up in my mailbox yesterday. Edit Note: Although dated February 22, 2008, the Press Release was posted on the Lavasoft website today, 25Feb08. Gothenburg, Sweden (February22, 2008) - Anti-spyware leader Lavasoft today announced a new addition to the management team. Cliff Everingham joined the company as Chief Technology Officer, while outgoing CTO, Joe Wells, shifts concentration as the new Key Scientist for Future Technologies at Lavasoft. With over 20 years in the IT/Telecom industry, Cliff offers extensive management experience, having worked with companies including Ericsson, 3GIS, Vodafone, and Cisco Systems. Everingham has an Engineering degree from the University of Technology in Sydney,Australia, and his Master degree in Business from Latrobe University in Melbourne,Australia. He was a key member of the 3G Strategies Group with Ericsson Sweden where he authored multiple white papers on product development. Founded in 1999, Lavasoft is"the original anti-spyware company", with over a quarter of a billion downloads worldwide for the flagship Ad-Aware product. A private company headquartered in Gothenburg,Sweden, Lavasoft provides security solutions for individual consumers and enterprise clients alike, including anti-spyware, registry optimization, firewall, digital shredding, and encryption. Lavasoft has 4,000 partners in 120 countries. For further information, please contact Michael Helander, Vice President of Marketing at Lavasoft, telephone +46 733 18 45 63 or press@lavasoft.com." Did you ask why the announcement appears strange? Of course I will tell you. It was as recent as August, 2007, that Lavasoft announced that the respected Joe Wells was joining Lavasoft as Chief Technical Officer (CTO). Six months later, a telecommunications specialist is assuming the position of CTO at a company that specializes in malware removal and other computer security products. How strange does that sound? "Lavasoft is pleased to announce that a leading innovator in the security industry, Joseph Wells, has joined the company’s management team as chief technology officer. Wells is well-known for his extensive career in anti-Trojan and anti-virus solutions as well as his more recent work within anti-spyware and emerging security threats. Along with his widely recognized work in the security software field, Wells has authored over 60 technical articles and scientific papers. He is renowned as the founder of WildList Organization International, a global cooperative identifying and reporting the latest virus threats." "Previously the chief antivirus architect at Fortinet, Wells is widely known for his work in research and development of security software. He developed his first product, a virus/Trojan detector, in 1988. Since then, he has made numerous technical contributions to the industry while working for Certus International, Symantec's Peter Norton Group, IBM's Thomas J. Watson Research Center and Cybersoft. Joe was also CEO of WarLab, a subsidiary of Trend Micro. A prolific writer, Wells has authored over 60 technical articles and scientific papers in the field of security research and has been the chief editor of two online technical journals. He is best known as the Founder of the WildList Organization International." Perhaps the next CTO will be a cartoonist. Microsoft made a major announcement today on the availability of technology available. I have encapsulated the highlights below. Complete information is available in the references at the end. Microsoft is changing policies on how information on the high volume products and technologies. The changes will hopefully help increase opportunities for developers, partners, customers and competitors. Publish on the MSDN Web site more than 30,000 pages of documentation for Windows client and server protocols, previously available only under a trade secret license. 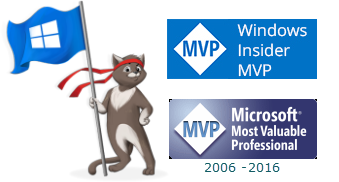 Publish protocol documentation for additional products, such as Office 2007, in upcoming months. Provide access to the protocols for free for development and non-commercial distribution to open source developers. License related patents on reasonable and non-discriminatory terms, at low royalty rates for commercial distribution. Document how Microsoft supports industry standards. Document any extensions affecting interoperability that are implemented in Microsoft products, available on Microsoft Web site without a license, royalty or other fee required for access. (Any related Microsoft patents that cover these extensions will be available on reasonable and non-discriminatory terms. Develop new APIs for Microsoft Word, Excel and PowerPoint applications that will enable developers to plug in additional document formats and allow users to select those formats as their default for saving documents. Windows XP users note that Service Pack 3 is not far away. Microsoft made Release Candidate 2 available today via Windows Update. Note: This is Release Candidate, not necessarily the final product and thus, still Beta. Never run a beta software on a production machine. If you have been following the information being provided on the release of Windows Vista SP1, you should have noticed that there are prerequisites that Microsoft indicated would be made available via Windows Update. KB 937287 updates the Windows Vista installation software. The installation software is the component that handles the installation and removal of software updates, language packs, optional Windows features, and service packs. This update is necessary to successfully install and uninstall Windows Vista SP1 on all editions of Windows Vista. After installation, it cannot be removed. KB 938371 updates Windows Vista in order to install or to remove Service Pack 1 more reliably. This update must be applied separately before you install Windows Vista SP1 to make sure that Windows Vista SP1 can be installed or removed from the computer. This update is necessary to install and to uninstall Windows Vista SP1 on all editions of Windows Vista. After you install this item, you cannot remove it. Windows Vista Enterprise and Windows Vista Ultimate have an additional prerequisite update that must be installed prior to KB 937287 and KB 938371. This is KB 935509, which was released to Windows Update in January. Neither KB 937287 or 938371 will be offered for users of Enterprise or Ultimate until KB 935509 has been installed. KB 935509 contains an update that you must have to correctly service Windows BitLocker Drive Encryption-capable computers and is only for Windows Vista Enterprise and Windows Vista Ultimate. To check that you have the prerequisites, go to Start\Control Panel\Security\Windows Update\View update history. I'm ready. How about you? 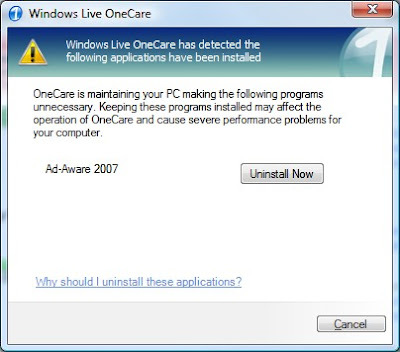 It appears that a 31Jan08 update to Windows Live OneCare (WLOC) has resulted in the Ad-Aware 2007 service being seen as a conflict. According to responses posted in the help topic at the Lavasoft Support forums, Lavasoft has been working to resolve the problem. Understandable, a new issue arises and it is necessary to determine the source of the conflict, working with the other vendor if needed. by Michael on February 13th, 2008 in Industry and Security News. Microsoft is pushing their weight around. We’ve got Ad-Aware customers contacting us left and right because Microsoft is telling them to uninstall their Ad-Aware software in order to run Windows Live OneCare “security software” (the quotation marks are mine). Some article title: "Microsoft Bullies"! LS Tobias tells Lavasoft customers that they are working with Microsoft and the VP of Marketing refers to them as bullies. Now that is class (not). I suppose Marketing VP's get away with being snippy, as in the "(the quotation marks are mine)" in reference to Windows Live OneCare security software. I guess it always takes two MS people to get your issues resolved? Thank you for that wonderful explanation, but isn’t Windows the reason that companies like ours are in business in the first place? No, Michael, "Windows" is not the reason why Lavasoft is in business. Nicolas Stark is the reason Lavasoft is in business when he took over the original "opt-out" program from Steve Gibson. The malware purveyors keep companies like Lavasoft in business. It is not uncommon for a security software vendor to point out conflicts between their software and that of another. Trend Micro even includes their own products as well as Ad-Aware as necessary to be uninstalled. See EN-1035951. "As mentioned earlier, Ad-Aware 2007 has changed from previous versions in that it now operates as a service that runs at boot time of the PC. This is discussed on the Lavasoft Support forums at the folllowing link. Though the free version of Ad-Aware 2007 doesn't include the associated Ad-Watch real-time active mode protection, this service is still loaded at boot time to provide the application with elevated rights to cope with malware, even when the logged in user has limited rights themselves. Though this choice makes sense for the more effective removal of malware, it creates a new problem. The issue is that when Ad-Aware detects malware the service will attempt to 'take control' and remove the infection, which makes sense by iteself. However, if another anti-malware application also exists on the PC, it may also detect the same malware with its real-time protection at the same moment. Now you have an issue where two programs are competing to remove the same piece of malware at the same moment, i.e. a conflict." Microsoft has released the February 2008 Security Bulletin Details. Additional information is available at the linked Bulletin. Many of the updates will require a computer restart. The Microsoft Baseline Security Analyzer can detect which updates your computer system requires. As reported in the MSRC posting, one update anticipated to be released has been with held for further testing. "A number of malicious PDF files have been seen in the wild and we’ve had reports of infection attempts using a vulnerability in Adobe Reader. You can update your system by downloading the new Adobe Reader at http://www.adobe.com/products/acrobat/readstep2.html"
Watch out for the pre-checked install of Photoshop Album Starter Edition! Although it isn't as bad as a toolbar, you don't likely want a starter package foisted on your computer (probably with limited features). Freedomlist member, Lost, certainly got it right when he referred to the old Douglas Adams quotation: "If it looks like a duck, and quacks like a duck, we have at least to consider the possibility that we have a small aquatic bird of the family anatidae on our hands." in reference to a recent Information Week article on ComScore. "Market research tracking software (we have dubbed it 'researchware') needs to be differentiated from 'adware,' 'spyware,' and 'malware' and should not be treated in the same way as these intrusive and potentially harmful applications," Fulgoni said in a blog post Wednesday. "We must not let the purveyors of spyware -- the rotten apples -- give market researchers a bad name." "Spyware is computer software that is installed surreptitiously on a personal computer to intercept or take partial control over the user's interaction with the computer, without the user's informed consent.
. . . Spyware programs can collect various types of personal information . . . "
"Privacy-invasive software is a category of computer software that ignores users’ privacy and that is distributed with a specific intent, often of a commercial nature. Three typical examples of privacy-invasive software are adware, spyware and content hijacking programs." ComScore apparently is of the belief that the trade off of the accelerators, games, and screen savers that come with the company's tracking software makes everything acceptable. I don't care what it is called. Call it duckware, spyware, trackware or researchware. If a software installs without notice or my permission and then "reports home", I consider it BADware. Many websites and forums use "Captcha" features to keep spammers at bay. In an interesting report, Websense Security Labs illustrates how spammers have created bots capable of getting past the Captcha feature and sign up for Windows Live Mail accounts. "Websense believes that these accounts could be used by the spammers at any time for a variety of social-engineering attacks in future. A wide range of attacks would be possible using the same account credentials in other significant and extended Live services offered by Microsoft Corporation, such as Live Messenger (instant messaging), Live Spaces (online storage), etc." See the illustrated report at Streamlined anti-CAPTCHA operations by spammers on Microsoft Windows Live Mail. A recent update to the Kaspersky signature files resulted in Kaspersky Internet Security issuing "Phishing Attack" warning messages on all Blogger blogs when visited. Although Kaspersky's database updates were running 3-4 hours behind for end users, it appears that the updates have finally caught up. Should you encounter what you believe may be a false/positive with the Kaspersky signature files, send an e-mail addressed to notspam(AT)kaspersky.com. The parent company is now AVG Technologies N.V. The Czech Republic-based company is now AVG Technologies CZ, s.r.o. The US-based company is now AVG Technologies USA, Inc. The UK-based company, already operating under the AVG name, will now be known as AVG Technologies UK Ltd.
Members of the security community frequently have users employ AVG Anti-Spyware in clean-up efforts. Along with subscription packages, AVG provides Windows Vista compatible anti-virus software free for personal use. A couple of weeks ago, I thanked some of the special people in my on-line world who have served as mentors. I "met" this group of special individuals via a link created in a software update notice which led to a recording by one of those mentors. That recording led me down the garden path where I find myself today. That mentor is Aaron Hulett, a friend who continues to take the time to explain the "techie" details in easy-to-comprehend non-techie terms. The most recent example came about when a member of The LandzDown Forum (affectionately referred to as LzD) asked how serious it is when a computer suddenly loses power. See for yourself one reason why I admire Aaron in his response in the "sudden power loss question". "One way to increase your chances of getting a legitimate download is to compare the MD5 checksum of the file you download against an MD5 checksum for the file, published by a known and trusted source. An MD5 checksum is a mathematical hash of a file that reduces it to a series of numbers and letters. If even a single bit is changed, the hash won’t match and you should be suspicious." It is important to note that you should also check the digital signature of any executable file tomake sure it is from the claimed source. Right-click an executable file that has been digitally signed to see the Digital Signatures tab. If it matches, you will know that the file has not been tampered with since it was signed, not that it is safe. Of course the best practice is to download software programs and updates only from the originating vendor. When it comes to Microsoft software/updates, this is even more critical. Too many people are fooled by the phony e-mails claiming to be from Microsoft. As I have written before, Microsoft Does NOT Send Updates Via Email. See Ed's A Vista SP1 FAQ. If you have a question that Ed hasn't answered already, ask in the Talkback section. Information and instructions on MD5 checksum is available in A useful file integrity checker. Warning - After reading the articles linked below, some folks may get curious about the registry and decide to do some independent investigation. If you (or a registry cleaner/program) modify the registry incorrectly, serious problems might result -- sufficiently serious to require the operating system to be reinstalled. Modify the registry at your own risk. Now on to the topic at hand. Every month myself and many others provide information on the latest Microsoft security updates. When a security update relate to Internet Explorer, ActiveX is frequently mentioned. “Kill-Bits” are commonly part of the security update used to disable individual ActiveX controls. The Security Vulnerability Research & Defense bloggers really went to town to first provide background information on how to determine wither ActiveX vulnerabilities are exploitable in Internet Explorer. This was followed up with a three-part Kill-Bit FAQ. Mozilla released Firefox 2.0.0.12 today which includes the security fixes noted below. Existing users can select Help > Check for Updates. If you need assistance, instructions for updating Firefox are available here. The information provided in the Security Bulletin Advance Notice pertains only to non-security, high-priority updates on Microsoft Update, Windows Update, and Windows Server Update Services released on the same day as the security bulletin summary. Information is not provided about non-security updates released on other days. Below is a summary of the February 2008 Microsoft Security bulletins (in order of severity). Microsoft Baseline Security Analyzer can detect whether your computer system requires these updates. Some of the updates will require a restart. Affected Software: Windows, Office, Visual Basic. Affected Software: Windows, VBScript, JScript. Affected Software: Windows, Internet Explorer. Affected Software: Windows, Active Directory, ADAM. Affected Software: Office, Works, Works Suite. First a definition of terms. EULA stands for "End User License Agreement" and TOS for "Terms of Service". Although it isn't necessary to remember what the acronyms stand for, it is important to read the EULA or TOS when subscribing to or downloading software. Unfortunately, we do not generally see a EULA like the Best EULA Ever originally posted on the SunbeltBLOG. Instead, the font is generally small and the language is filled with what appears to be more double-talk than something that makes a lot of sense. More than that, we are faced with that "I accept" or "I do not accept" right at the moment of installing the software we just downloaded. How many people actually stop and read the agreement? Whatever you think we said, or whatever we said, about the product may have nothing to do with reality, and you agree not to expect that it does. No matter what happens, including damage to your equipment or even someone's death, you agree not to blame us even if it is our fault. If we are a Web site and you use it, no matter what bad things happen, it is not our fault. If you contribute anything at all to a site or system, we own it. You will never sue us for anything, ever." "EULAlyzer can analyze license agreements in seconds, and provide a detailed listing of potentially interesting words and phrases. Discover if the software you're about to install displays pop-up ads, transmits personally identifiable information, uses unique identifiers to track you, or much much more." You won't get legal advice with EULAlyzer. However, you will have a much better idea of what you are agreeing to before installing the software. Mike Nash has a long blog post on the Windows Vista Team Blog about the Windows Vista SP1 RTM. I'll stick with the highlights here and you can read the full post at the link provided. OEM partners will get SP1 so new Windows Vista PCs will have SP1 pre-installed. Microsoft will start the manufacturing process for the retail product of Windows Vista with SP1. Microsoft will start the process to manufacture DVDs for enterprise customers who get software via the Volume Licensing program. In mid-March Windows Vista SP1 to (in English, French, Spanish, German and Japanese) will be released to Windows update and to the download center on microsoft.com. In mid-April, Windows Vista SP1 will be released to Windows Vista customers who have chosen to have updates downloaded automatically. April, the remaining languages to RTM. Beta testing of SP1 identified an issue with a small set of device drivers which do not follow Microsoft guidelines for driver installation. Although reinstalling the drivers solved the problem, SP1 will not be offered SP1 via Windows Update until the affected drivers have been updated by the vendor(s). As updates for the affected drivers become available, they will be installed automatically by Windows Update, which will unblock these systems from getting SP1.